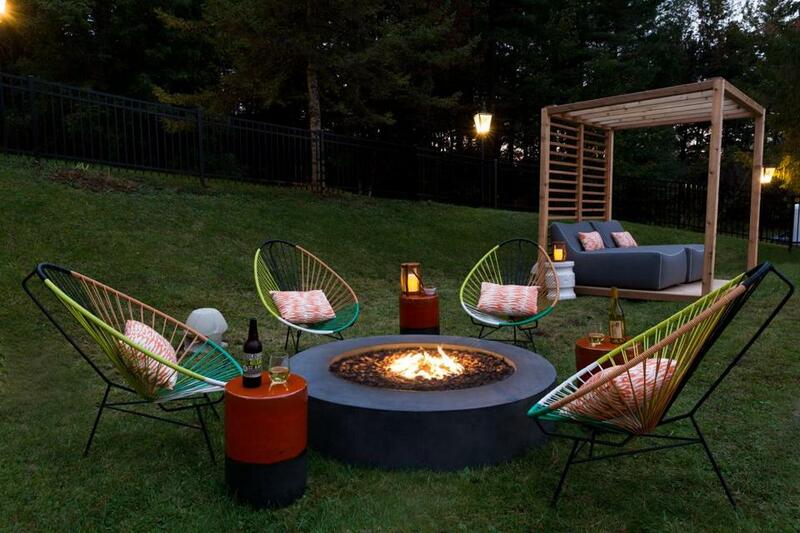 A fire pit at the Field Guide hotel in Stowe, Vt.
What better way to celebrate a dad than to turn his special day into a weekend? For the dad who is your field guide, head to Field Guide, a rustically hip boutique hotel in the heart of Stowe, Vt. The luxe lodge boasts an epic mountain view, which you can soak in while soaking in an outdoor heated pool or hot tub. Book a Father’s Day special suite from June 16 to 30 to get a family hiking care package — trail mix, bottled water, and maps to the nearby nature trails — and dad gets a complimentary four-pack of local Vermont brews on his return. He’ll also get a $10 credit to a post-hike picnic at the onsite Picnic Social, where summer fare includes cheeseburgers with local cheddar, smashed fingerling potatoes, heirloom tomato toast with avocado, and ice cream sandwiches. Grab a blanket and enjoy your spread out back. For dessert, roast s’mores by the fire pit. Aside from the natural beauty, the hotel itself is a stunner, designed thoughtfully and creatively with Vermont in mind: wall-mounted papier-mache animal heads, brick fireplaces, exposed beams, a tree stump sitting by the bathtub, camp bedrolls upholstered into bed headboards. Each room is stocked with an iPad field guide, loaded with informative apps about area adventures; dad can swipe to choose his escapade, from fishing tours to rock climbing, brewery tours to zip-lining. He’ll wake to complimentary breakfast in bed: homemade banana bread, baked eggs, overnight oats, fresh fruit, and more. Two nights required for the package; rates start at $718. 433 Mountain Road, Stowe. 802-253-8088. www.fieldguidestowe.com. If the old man’s a golfer, check out The Meadowmere Resort in Ogunquit, Maine, where the Father’s Day Golf Package includes complimentary 18 holes at nearby The Links at Outlook. Later, head to Ogunquit Beach or relax poolside before dining at the on-site Jonathan’s Restaurant, where dad gets a complimentary dinner of his choice — options include grilled filet mignon, scallop-and-shrimp-stuffed North Atlantic haddock, and Mediterranean pasta with farm-raised lamb. Wake to complimentary breakfast. June 17 to 19. Two nights required for package; rates vary. 74 Main St., Ogunquit, Maine. 207-646-9661. www.meadowmere.com. Sebasco Harbor Resort, a sweeping 550 acres of rolling green and coastline in Phippsburg, Maine, boasts a saltwater oceanfront pool, tennis court, spa, canoeing and sea-kayaking in the harbor, candlepin bowling alley, and nine-hole oceanside golf course, among other activities. Kids can stay, but there are various midweek packages for two that mom and dad might want to take advantage of — including a night in a real lighthouse with lobster dinner, or a “Stay and Play” golf package for two that includes golfing on the resort’s course and complimentary breakfast and dinner at on-campus Pilot House. Sample fare includes seared Maine scallops, filet mignon, rack of lamb, or Maine lobster dinner. Packages and rates vary. 29 Kenyon Road, Phippsburg. 207-613-4022. www.sebasco.com. New England is home to some great public golf courses and clubs where dad can play a round of golf and also enjoy a celebratory meal. If canoeing floats his boat, head to the Father’s Day Weekend Canoe & Brunch at the Broadmoor Wildlife Sanctuary in Natick June 18 from 8:30 a.m. to 12:30 p.m. Pa can paddle the early morning away on the Rocky Narrows Reservation, where he just might see an otter, turtle, or great blue heron. Brunch is served halfway through on the riverbanks. Audubon members $46-$56. Registration required. Age 13 and up. 508-655-2296 www.massaudubon.org. 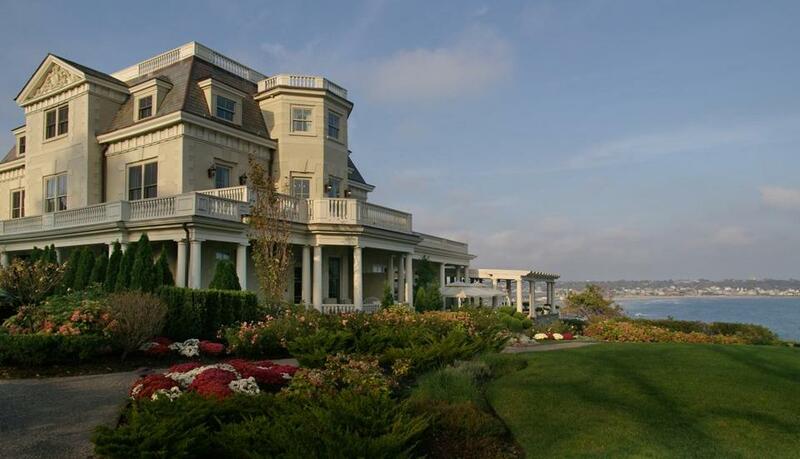 The Chanler mansion on the Newport Cliff Walk. Snap Facebook-worthy #FathersDay pics on Newport’s famed Cliff Walk, which starts near Easton Beach, and winds by the Atlantic, cliffs, and oceanside mansions. (Free. Memorial Boulevard, Newport. www.cliffwalk.com.) Stay at the Chanler on Cliff Walk, where, on Father’s Day, dads get truffles, nuts, a shot glass, a bottle of Grand Marnier, and two snifters. Wake to breakfast overlooking the ocean; typical fare includes honey and buttermilk pancakes with vanilla butter and eggs Benedict with Canadian bacon and lyonnaise potatoes. Rates start at $415. 117 Memorial Blvd. 401-847-1300. www.thechanler.com. Tennis buffs might also want to check out the International Tennis Hall of Fame, a short walk from the hotel. Browse a comprehensive museum of the game’s history; dad can even book an hour of playtime on grass courts. Museum: $15 adults, free for kids 16 and under. Courts, $120 for an hour. 194 Bellevue Ave., Newport. 401-849-3990. www.tennisfame.com. Spend a Sunday by the water in Bristol, R.I., at the 3rd Annual Bristol Oyster Festival on Father’s Day. The family-friendly event on the oceanfront Thames Street includes live music, pony rides, silent auction, shucking demonstrations, and plenty of food — oysters and otherwise. Free admission. 11 a.m. to 4 p.m. Food prices vary; proceeds go to the March of Dimes. Presented by De Wolf Tavern, 259 Thames St., Bristol, R.I. 401-254-2005. www.dewolftavern.com.